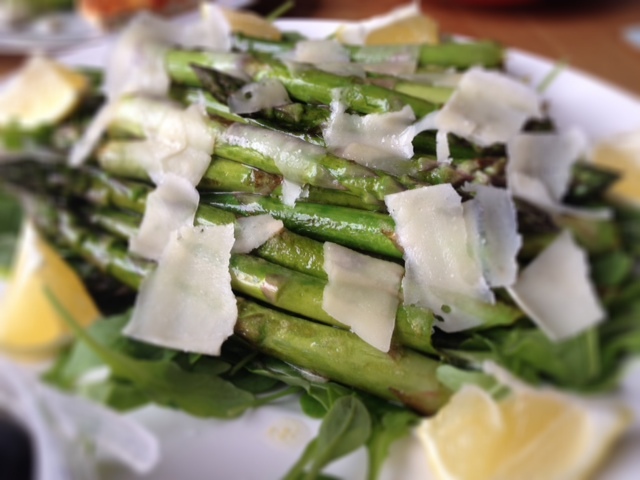 This incredibly simple, yet very tasty, asparagus salad went down really well with the book club on Monday. I invaded Charlotte’s kitchen (sorry and thanks!) and made this at her house while chatting and making tea. We always have a potluck supper at our book club gatherings and the spread this time consisted of salad with feta and tomatoes, crusty bread and baked camembert, pizza and olives. And choccies for pudding. Break off the wooden ends of the asparagus and wash them. Sauté in batches in oil on medium heat, it takes about 5-10 minutes. Season. Mix the mustard with the juice from half the lemon and add the oil while whisking. Season. Spread the rocket onto a serving plate, add the asparagus, drizzle with the vinaigrette and scatter with parmesan shavings. Cut the rest of the lemon into wedges and serve with the asparagus.